H&R Cup Kit - Touring Cup Kit: H&R Cup Kits are the ideal solution for those that want a street-engineered performance suspension with super-low looks. More than the so-called ?matched? 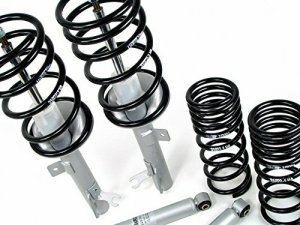 spring and shock packages offered by some, H&R Cup Kits are the result of over 25 years of experience in suspension design. With no guesswork involved, the H&R Cup Kit provides an application-specific spring and shock system designed to deliver improved handling, uncompromised ride comfort and sleek styling in one precision-engineered package. By popular demand, H&R designed the Touring Cup Kit line for enthusiasts that want less lowering while retaining the same high level of performance offered by the Sport Cup Kit. On average the Touring Cup Kits lower the vehicle ride height about 1.5 inches. Designed for street-performance, the new Touring Cup Kit product line provides an application-specific spring and shock system, just like the standard H&R Cup Kits. In comparison to the H&R Sport Cup Kit, the H&R Touring Cup Kit provides less lowering and similar performance. This kit is perfectly suited for the enthusiast that requires a perfect balance of aggressive performance, daily driven comfort, and higher ride height. Automotive enthusiasts have given rave reviews of the original H&R Sport Cup Kit, and already the new Touring Cup Kit is attracting a lot of attention. The new H&R Touring Cup Kit is destined to become a number one seller!